*Includes Revere's account of his Midnight Ride and Longfellow's famous poem "The Midnight Ride of Paul Revere"*Discusses some of the myths and legends about the Midnight Ride and the Battles of Lexington & Concord, including the debate over who fired first. *Includes pictures of important people, places, and events. *Includes a Table of Contents. "Out started six officers, seized my bridle, put their pistols to my breast, ordered me to dismount, which I did. One of them, who appeared to have the command there, and much of a gentleman, asked me where I came from; I told him. He asked what time I left . I told him, he seemed surprised, said 'Sir, may I crave your name?' I answered My name is Revere. Paul RevereApril 19, 1775 was the most momentous day in American history. Over the course of nearly 18 hours, a morning that began with midnight riders spreading an alarm about a British raid headed for Concord would lead to the British column fleeing for their lives back to the vicinity of Boston as thousands of militiamen headed to cut them off and surround them. By the time the sun went down, 10 years of strife between the 13 colonies and Great Britain finally boiled over into pitched battle and a Revolution. 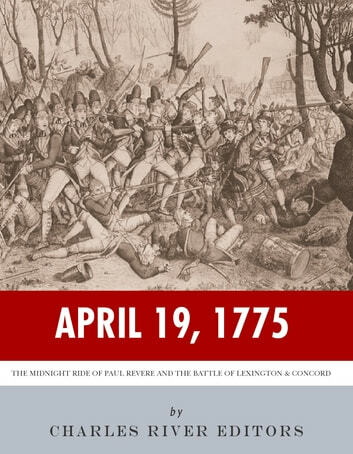 In the wake of the Revolution, the importance of April 19, 1775 became clear to everyone, and the legends and mystique surrounding that day have grown ever since. That day made an icon out of Paul Revere, who would have been greatly surprised at the end of his life if he had known he would become famous for his midnight ride. As a fervent and well-connected patriot who was part of Bostons intelligence network, Revere was sent on the ride toward Lexington along with William Dawes, with the intention of warning the countryside that British troops were heading that way presumably to arrest patriot leaders Samuel Adams and John Hancock. After warning Adams and Hancock, Revere, Dawes, and another messenger, Samuel Prescott were stopped and detained by British soldiers on the path toward Concord, and though Dawes and Prescott managed to escape, Revere was escorted back toward Lexington by the British that morning. As it turned out, Revere and the patriots were wrong about the actual reason for the British march that morning, and Revere did not successfully finish his own ride.The Battles of Lexington & Concord are just as full of legends. Its unclear who fired first at Lexington, but it resulted in a handful of colonial militiamen laying wounded or dying as the British continued on toward Concord, where they encountered far more organized resistance. As militias from across the countryside swarmed toward the action from neighboring towns and villages, the British forces began the march back to Boston, coming under fire alongside what would become fittingly known as Battle Road. By the time the British made it back to the safety of Boston, thousands of militia men had surrounded the city, beginning what would become a nearly year long siege. 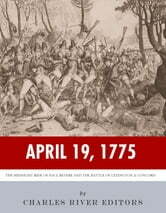 The American Revolution had officially begun.April 19, 1775 chronicles all of the momentous events of that historic day, explaining what led up to the British raid and Reveres midnight ride, discussing the lingering questions and misperceptions about the events, and analyzing their enduring legacies. Along with pictures of important people, places, and events, you will learn about the day the Revolution began like you never have before. Master the Tricks of the S.A.T.